With that, Laphroaig has really done no favor. He is not under any cannon, but Laphroaig may expect much more. The nose is still quite interesting, but even on the tongue you can tell him an immature youth, which also shows in the very short and actually only smoky finish. Where now exactly the influence of the four different barrels shows - no idea. Too bad that something like that gets cut out. Phenolic smoke with lemon flavor. Some stuffy wood in the background. Seaweed. Light and airy for a Laphroaig, but not thin. Lemon smoke again, but in a more dilute form than in the nose. Slightly metallic, with the taste of pebbles. A little salt, a little licorice, a bit of honey. But much more will not come then. Short. Too short. He leaves after a short time only cold smoke and a metallic aftertaste. Boh, but Laphroaig has really embarrassed! The nose is not 100% my thing, but overall very complex, quite interesting and in my opinion not behave at all, but rather equipped with a certain plumpness. What happens in the mouth, however, is shameful. Admittedly, no metallic approaches, not in the slightest, but still that is an absolute pharynx cleaner. Since I have Laphis with over 60% on the shelf, which have much less sharpness. The departure then makes sure that you do not keep it in bad memory, if you remember it at all, because there is no reason for it. Pity! Boom, first a neat turn phenolic smoke with kernel soap underlaid. Luckily, after a few seconds, the curd soap is much less intense, with caramel and a few mineral notes. After a while, add smoked meat and some disinfectants to the bouquet. Overall, the whole thing looks pretty musty. Unfortunately, after a short period of smoky meat, garlic, peaty caramel and granite dust merging into a beguiling mix, it is increasingly flattening and the soap is back. Disinfectant and stone dust are heated quite intensively, some citrus scares now also from behind in the nose. Overall, now clearly too angry. If the nose was at least quite interesting, then there's an alcohol club in the mouth. Really? Only 40% ?? Man, must he be young! Interestingly, but no sheet metal. In order to be able to define anything more sweet and smoky, the mouth first has to get used to the alcohol, in other words become numb. Boy, the third swallow is actually too spritig and sharp. Nothing against strong alcohol, but he should somehow be involved. A slight alcohol note can now also make out. Otherwise, unfortunately, there really is not much, a little dark caramel, slightly sugary, strong acidity from behind and a slightly superficial bitterness, which is increasingly established as the main note. He is unfortunately of a rather watery consistency. The finish is expected to be relatively long, with dark, caramel sweetness and behind the palate adhering, slightly chemical acid slowly fade away, to completely leave the palate a somewhat soapy (but interestingly not unpleasant) ashiness. 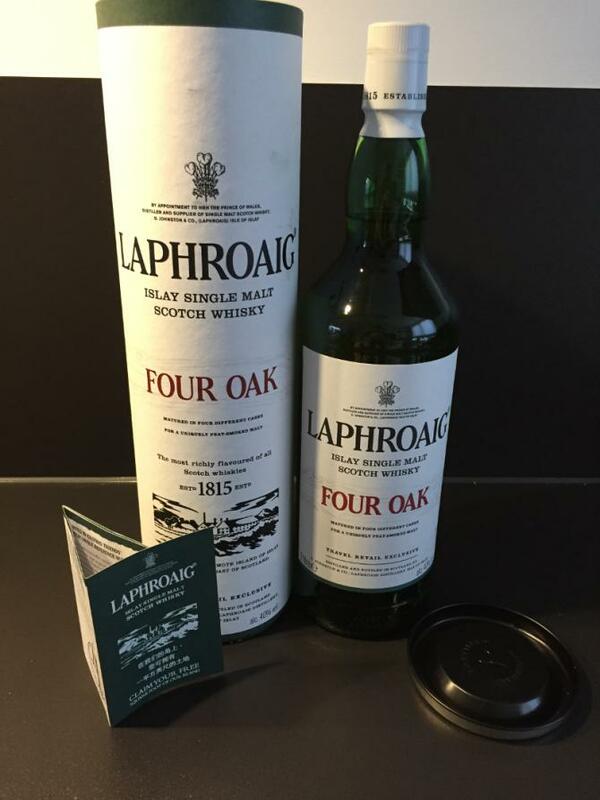 Nose: again a new NAS of Laphi - look - ah smokier than the Select, slightly medical and salty smoke, sour lemon, pleasantly sweet and slightly grassy, ​​the nose is simple and pleasing, which does not have to be bad. Taste: uih is thin, very smoky and peppery with a fresh and sour lemon note and nothing else. This sour note is even stronger in the finish, the smoke is milder and it adds a subtle oak bitterness. If the nose was still good in its simplicity, it completely falls apart in the mouth. The is now not a complete failure - he has no big Fehlnoten (if one of sour drops is ^ ^) and is very tasty but there is somehow missing in every nook and cranny. It's a pity what happened to Laphi. Apart from the 10cc CS, none of the bottles in the affordable segment are more convincing - let alone the whole NAS. Four Oak probably does not mean "4 great, selected Fassreifungen" but "everything on young xth-fill barrels zusammengekippt, what we could not otherwise use". For phenol and oil flap fans it might be something if it were not so thin, but for 55 € / liter is not enough. little sweetness (caramel), a lot of phenol, disinfectant, formaldehyde, used dilution, oily workshop cloths, at first a bit pungent (but this is limited), maybe a splash of lemon, a bit grassy, ​​looks rather chemical than "natural"
Hmmm, this is rather dissapointing. It is far from special. The nose is ok, but the taste isn’t good, actually there is not much taste. 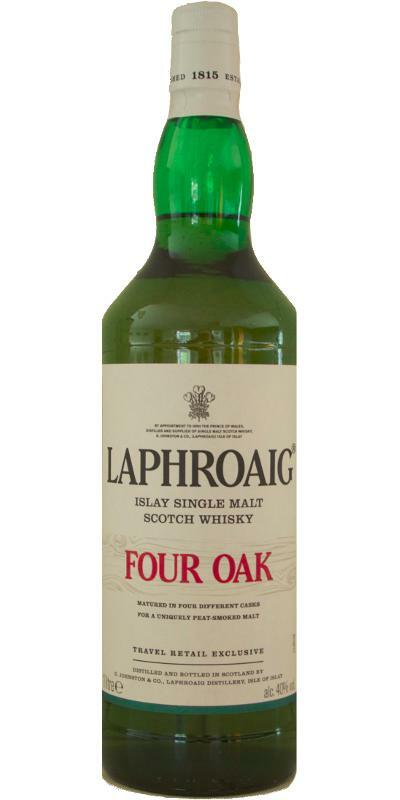 This is definitely not the best Laphroaig out there. There is some peat here, and it’s briny too. A little bit of seaweed. Also some soft vanilla aromas. A hint of lemon sourness, followed by ash. It’s a little lighter than what I’m used to from Laphroaig. It’s starts rather smoky. A thin mouthfeel, but this gets a little bit better later on. A bit peppery. Some vanilla on the background, and a pinch of liquorice. But that was about it. It’s flat and a bit out of balance. The finish is quite short, and a bit spicy. This is followed by some metallic notes. The cheap from the travel retail - NAS; Rather suitable for effect drinking than for enjoyment! Come on Laphroaig what is this?! Thin, watery bleeh. Very moderate Laphroaig. Thin and watery. Come on what is this! From the distillery that bring us great annual cask strength releases, this is a very disappointing release. What's up with this? Not unlike what I imagine peated porridge would smell like. Slightly briny too, and lots of coconut, with a touch of barbecue smoke and citrus. A tad shy. Weak, ashy, pinch of pepper some medicinal peat, dry. I don't know, anything else? Not really. Cigarette ash. Probably one of the shortest I've ever tasted for a heavily peated whisky.